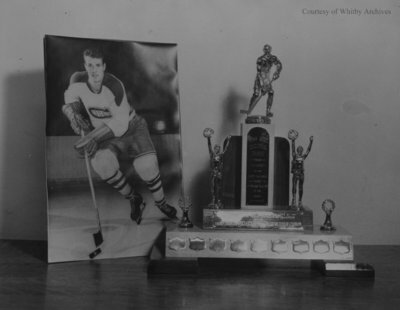 Black and white negative of a photograph of Ross Lowe in his Montreal Canadiens jersey beside the Ross Lowe Memorial trophy. This trophy was dedicated to the memory of Ross Lowe, a Whitby hockey player who died in a boating accident on 14 August 1955 at the age of 26. The Ross Lowe Memorial Trophy was awarded to the most valuable player on the Whitby Juvenile Hockey team. Ross Lowe was born in Oshawa on 21 September 1928 and moved to Whitby in the 1940s. He played minor hockey in Whitby in 1943-1944 and later for the Oshawa Generals. Lowe played for a number of NHL farm teams in Hershey, Pennsylvania, Victoria, British Columbia, and Springfield, Indiana. He briefly played for the Boston Bruins and Montreal Canadiens of the National Hockey League. In June 1955 he was signed by the New York Rangers, two months before his death. Photograph of Ross Lowe and the Ross Lowe Memorial Trophy, 1956, Photographer Unknown. Whitby Archives A2014_002_013.